A puppet girl struggling with her disabled part splits herself in two, casts off her disabled part and banishes it to the room of forgotten limbs. A Man falls from normality, breaks and reforms. As they go on their quests to find a sense of wholeness they navigate a dark world, encountering many characters on their way: a wise bug; fragmented and broken bodies; singing mouths in jars and silence. Mixing puppetry, mask and song, we will tell the freakish metamorphic tale of us. Audiences will be lead through a multi-sensory, interactive, Kafkaesque, telling of Pinocchio as never seen before. 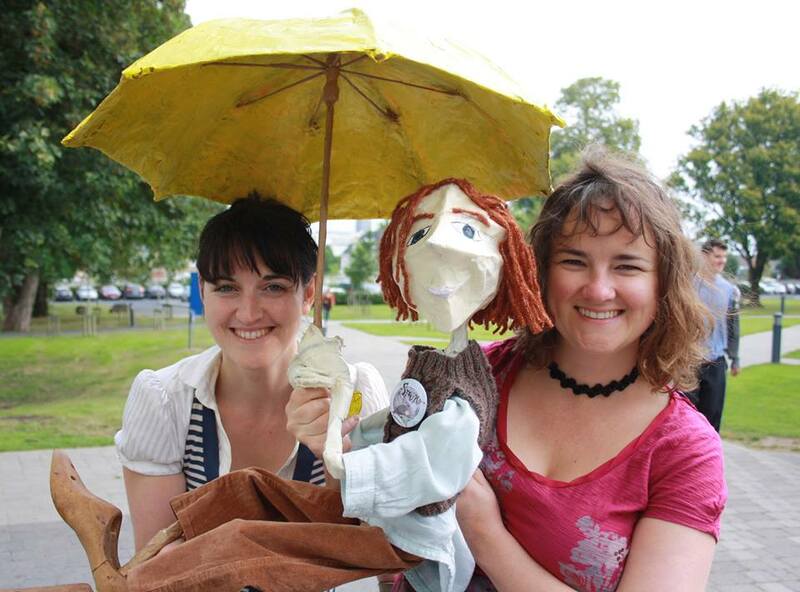 In early February 2016, members of the public were invited to call into Limerick’s iconic Park Kiosk, have a cuppa and a chat with Emma Fisher (puppeteer) and Ann Blake (musician). From these conversations the following song and shadow puppet short film, AWAKE, was made. 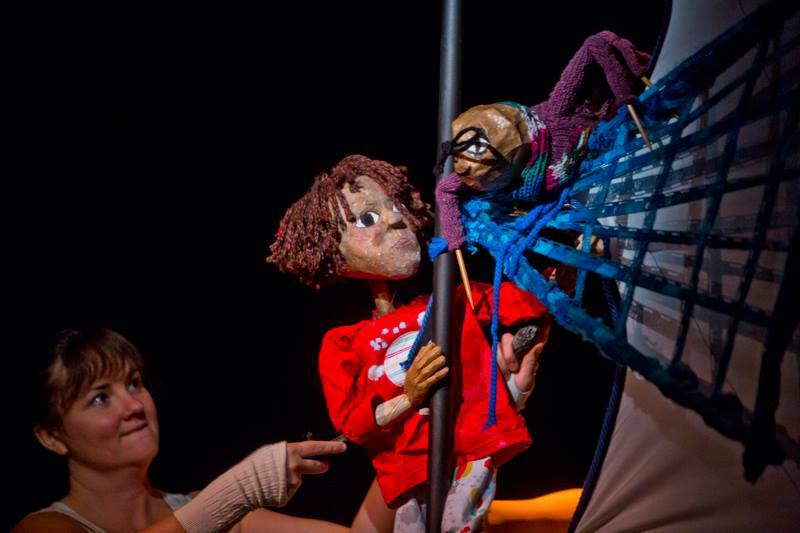 Spun is a story of friendship and imagination, told through puppetry, animation and song. Come with Ciaran and his imaginary friend Piedva the spider on their magical adventures. Based on a book by Emma Fisher and Thorey Mjallhvit H. Omarsdottir and directed by Liz Walker of Invisible Thread Theatre of Animation. Spun is a story of friendship in unlikely places, adventure and fun, told through puppetry, animation and song. Take a ride in a bathtub with Ciaran and let Piedva the spider spin you new adventures. Sail to sea, fly through the air, hold a star and meet turtles, giraffes and acrobatic children. For children aged 2-6 yrs and their families. Based on the illustrated book Spun by Emma Fisher & Thorey Mjallhvit H. Omarsdottir. Presented by Beyond the Bark Puppet & Installation Theatre. Spun is funded by Limerick City of Culture under the Made in Limerick strand. 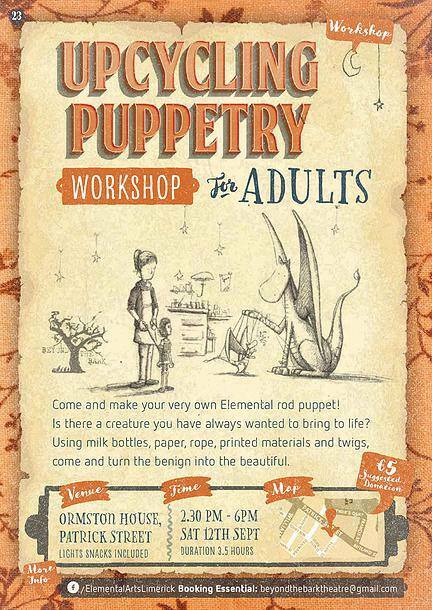 Come and Make your very own Elemental rod puppet. Is there a creature you have always wanted tp bring to life? Spun finally out in print! 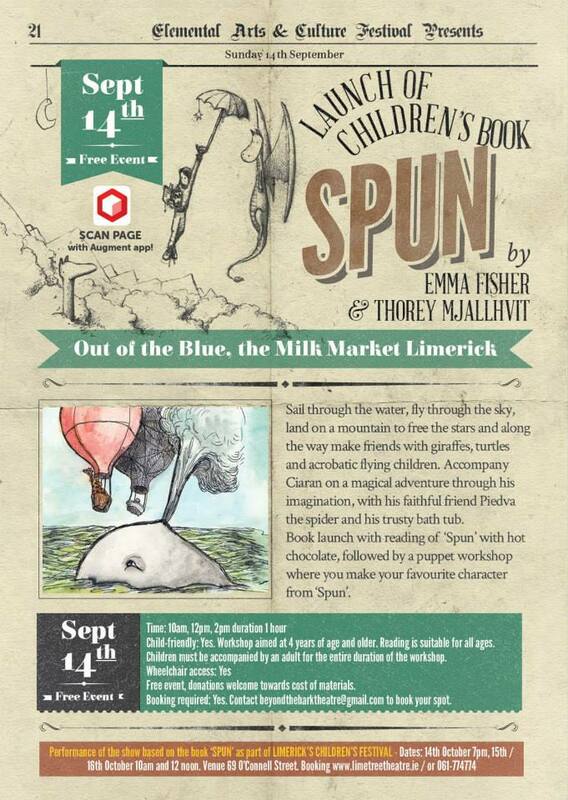 Book launch with reading of Spun by Emma Fisher and Thorey Mjallhvit H. Omarsdottir as part of the Elemental Arts and Cultural Festival, with hot chocolate followed by a puppet workshop where you make your favourite character from Spun. Sail through the water, fly through the sky, land on a mountain to free the stars and along the way make friends with giraffes, turtles and acrobatic flying children. Accompany Ciarán on a magical adventure through his imagination, with his faithful friend Piedva the spider and his trusty bath tub. “Have you ever wondered where the stars go during the day? I keep them in my umbrella,” said the Star Keeper. Sail through the sea, fly through the sky, land on a mountain, free the stars and along the way make friends with giraffes, turtles and acrobatic flying children. Come with Ciaran on a magical adventure through his imagination with his faithful friend, Piedva the spider, and his trusty bath tub. Spun is a story of friendship in unlikely places, a story of adventure and fun, told through puppetry, animation and song. Directed by renowned international puppeteer Liz Walker. Based on the book “Spun” by Emma Fisher and Thorey Mjallhvit H. Omarsdottir. For children aged 2-6 and beyond. Be sure to book early as numbers are limited to 80 per show.